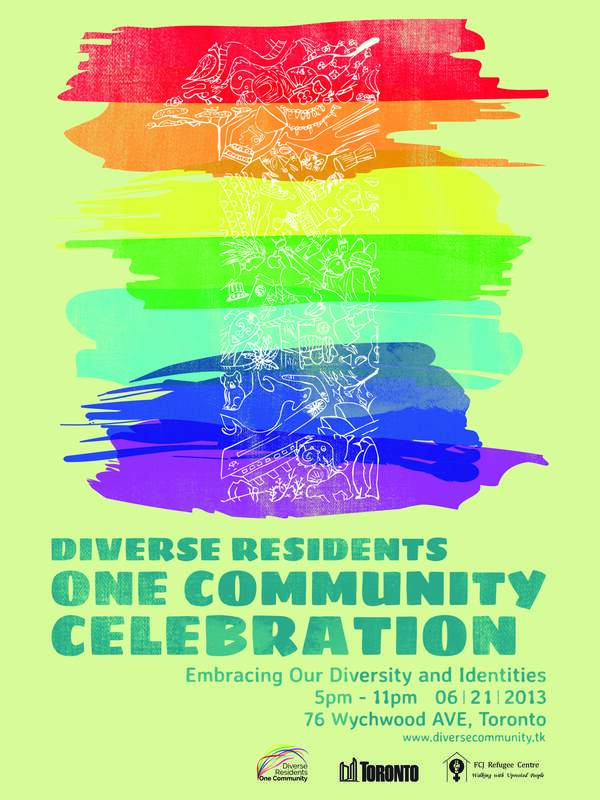 FCJ Refugee Centre is organizing the Diverse Residents One Community Celebration where many LGBTQ newcomer artists will have the opportunity to express their talents and gain community support. This event is possible thanks to the support of the Community festivals and Special Events of the City of Toronto, who always is looking to create spaces of non-discrimination and inclusion.All steps of this festival have been developed through an anti-racist, anti-oppressive, feminist framework. Beside the City of Toronto, there are a lot of hands of volunteers from different organizations, such Sherbourne Health Centre, The 519 Community Centre, Black- CAP, and OCASI, who are helping with the promotions and preparation of the festival. The event is going to take place at the Artscape Wychwood Barns located in 76 Wychwood Ave, Toronto, ON M6G 4C6 (Wychwood Ave and 601 Christie St.), from 5:00 pm to 11:00 pm. The performers of the day will put on shows such as live dance performances, singing and modelling shows. Also, with the presence of food and Art Vendors from different cultures and backgrounds is going to be a variety of food and artistic products displayed from almost all parts of the world, Spanish, Mexican, Turkish, Asian, North and South American, African and more which will suit out goal of diverse community celebration. One of the motivations on the creation of this festival is because despite the progress Canada has made in including and promoting equality for LGBTQ populations, there are multiple oppressive and homophobic systems still at play that are negatively impacting these populations. For FCJ Refugee Centre events like this are becoming more important to offset the vast disparity that still exists, and work towards a Canada that we can be proud of – a Canada that recognizes the barriers that LGBTQ refugees face and actively welcomes communities from around the world.